Identity theft is the process of stealing personally identifiable information (PII) such as, your name, address, Social Security number and email address. Identity fraud is the unauthorized use of stolen PII to achieve financial gain. Identity fraud can range from using a stolen payment card account, making a fraudulent purchase, taking control of existing accounts or opening new accounts. Personally identifiable information is highly valued by identity thieves. According to The 2018 Identity Fraud Study by Javelin Strategy & Research, there were 16.7 million U.S. victims in 2017 with $16.8 billion dollars stolen. Why is PII Highly Valued By Identity Thieves? Identity thieves use stolen personally identifiable information for their own purpose, and then either sell it on the dark web or post it online for all to see. There is no age limit to becoming a victim. CNN reported that the personal details of children, including Social Security numbers, mother’s maiden name and date of birth were found for sale on the dark web. It’s not just individuals that are at risk for identity theft/fraud. Business identity theft is also commonplace as criminals hijack company websites and phone numbers. Identity theft can happen to anyone. Here are a few ways in which identity thieves may steal your information. Recent data breaches have left millions vulnerable to identity theft and fraud. It is estimated that over 145 million Americans were affected by the 2017 Equifax data breach. The PII stolen; Social Security numbers, date of birth, credit card numbers, driver’s license numbers and telephones numbers is the type of information needed to confirm identity for various types of applications. As reported by the Washington Post, in a national class-action suit against Equifax, it is alleged that criminals are already using the stolen information to apply for mortgages, credit cards and student loans. Social identity theft/fraud has become epidemic. It’s estimated that tens of millions of fake accounts have permeated social media sites. Stolen identities; names, photos, personal information provide the raw material for bots or automated accounts. The New York Times reported in January, 2018 that an American company named Devumi has collected millions of dollars in a murky global marketplace for social media fraud. According to the report, “Devumi sells Twitter followers and retweets to celebrities, businesses and anyone who wants to appear more popular or exert influence online”. Social identity theft is also making headlines in the world of politics. As reported by the Washington Post, two Frenchmen are going on trial Wednesday March 14, 2018 for allegedly stealing Emmanuel Macron’s online identity when he was running for president in the 2017 election. Cyber espionage groups and state sponsored hackers have also stolen photos and personal information from real people to create fake personas, Mia Ash is just one example. However, this type of social identity theft is not just happening in the world of spies, espionage, politicians and celebrities. Consider what happen to Alexandre Martinez. Over a period of five years, the alleged perpetrator, Spas Visiliva, stole Mr. Martinez’s name, personal information and photos from his social media account and used it to create multiple fake online identities. Mr. Martinez became well-known in Bulgaria as ‘Alexandre Nicolov’, a rich and successful manager, landing top jobs at multinational corporations and consultancy firms including Airbus. He also had a large online following that included journalists and politicians. 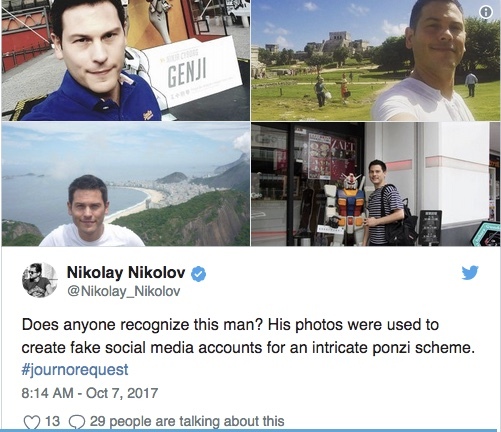 After patiently waiting years for trust to develop with “Alexandre Nicolov’s” online followers, Spas Visiliva, initiated a ponzi scheme, offering discounted flights through Facebook. Apple IDs are hot commodities. According to Proofpoint, Apple IDs are the #1 target for credential theft emails. When you consider that most Apple ID’s are connected to a credit card or bank card, keeping it secure is as important as protecting the safety of your financial accounts. With a stolen Apple ID a criminal can get access to the linked iCloud account with the potential for identity theft. This particular phishing email targeting IPhone users was reported on in October, 2017. Using low privacy or no privacy settings. Accepting invitations to connect from unfamiliar persons or contacts. Downloading free applications for use on your profile. Giving your password or other account details to people you know. Participating in quizzes which may require you to divulge a lot of personal information. Clicking on links that lead you to other websites, even if the link was sent to you by a friend or posted on your friend’s profile. Falling for email scams (phishing) that ask you to update your social networking profiles. Using no or out-of-date security software to prevent malicious software from being loaded onto your computer and stealing personal information. One last reminder. The transition to digital documents may make dumpster diving seem old-fashioned and past its heyday. However, it still poses a very real risk for individuals and companies. This video shows what can happen when you throw away mail that contains sensitive information.